Our 5th Semifinalist for the Chanukah Recipe Contest is Jerusalem JewishMOM Adi Bitter. In addition to raising her 4 children, Adi is an educator and Yoetzet Halacha. This is a simplified version of the popular Israeli “Sufganiyot Eshel,” which are made from a loose batter dropped into hot oil. 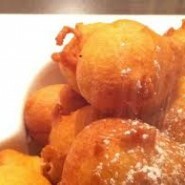 The fact that the batter is loose means it makes non-uniform, fun-shaped doughnuts that are reminiscent in taste and consistency to Donut Holes, and take only a few minutes to make. This is a halved recipe. Plunk by large spoonful into the pot of heated oil. Fry until golden on all sides, about 4 minutes (this may involve flipping the bouyant shape around a few times). Remove to a plate covered with paper towel to absorb excess oil. Dust with confectioner’s sugar. This year, I also slid a chocolate coin into the spoonful of raw batter and buried it before plunking it into the oil – the kids enjoyed the chocolatey treat!